Intel today announced that its board of directors had named Robert Swan, its CFO and interim CEO, as full-time chief executive officer. Mr. Swan will be the company's first CEO with financial background. As the head of the company, Mr. Swan will continue Intel's transformation from a PC-centric to a data-centric company with a focus on improving execution and aggressive capturing of addressable markets using ambitious technologies. Robert Swan becomes chief exec of Intel at a rather interesting, yet challenging time. The world is at a strategic inflection point when multiple technologies have to converge in a bid to enable the next phase of industrial and social development. To stay relevant, Intel not only needs to retain its leading position as a developer and maker of CPUs and compute platforms, but also gain new important competencies. Meanwhile, the company is facing multiple challenges. Its traditional rivals are getting stronger (partly because they are forming alliances) and new competitors are emerging. In the meantime, Intel's leadership in semiconductor production is now challenged and many of its opponents have certain advantages. 6. He is the first Intel CEO, who is not the company’s veteran. Meanwhile, has had a solid experience working at high-tech companies. Prior to Intel, he worked at General Atlantic, an equity investment firm, and before that he served as CFO at eBay. Throughout his career he worked at Electronic Data Systems, TRW, Webvan Group, and General Electric. I am honored and humbled to be named Intel's CEO. I loved my role as the CFO, and over the past seven months I have come to love our company even more – and its mission, employees and customers. When the board approached about the CEO role, I jumped at the opportunity to remove "interim" from my title. As an executive team, we will focus relentlessly on building great teams and culture, and delighting our customers. Leadership is a team sport and is about bringing together the team, setting the direction and letting the team unencumbered – so they can achieve things nobody thought was possible. My biggest learning about the last seven months is how important we are to our customers, and the responsibility and opportunity that goes with that. When we move into the next few weeks and months, we'll be focused on four critical imperatives. Second, our core strategy is not changing: We have been embarked on what we believe can be the most successful transformation in corporate history. We are evolving from a PC-centric to a data-centric company that builds the technology foundation powering the worlds innovations. What will change is how we serve our customers and how we partner and build the best technology together. By listening to how we can make our customers live better by helping them delight their customers, we will win. Fourth, we have a powerful culture, and to achieve our ambitions we must evolve. Our culture must encourage every employee to be bold and fearlessly focused on going beyond what they thought possible. And, the culture must honor truth and transparency, customer-obsession, and coming together as "One Intel." Intel has an amazing legacy, but our aspirations have grown. We need to continue to evolve to continue making Intel's future even brighter than our story fits. We've got an incredible foundation to build on – and look forward to all that we can achieve together in the future. 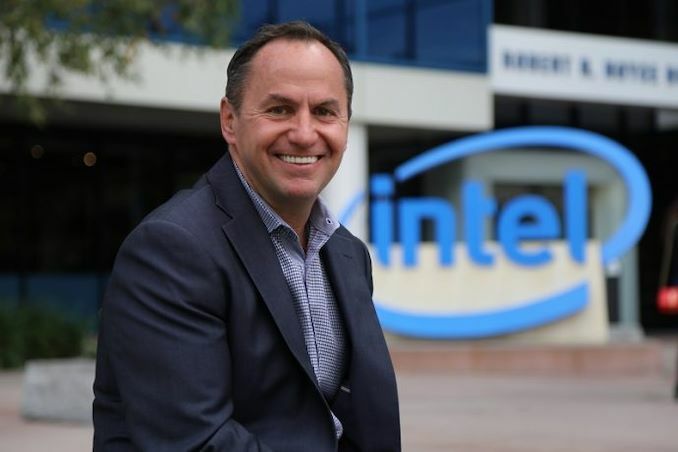 SANTA CLARA, Calif., Jan. 31, 2019 – Intel Corporation (NASDAQ: INTC) today announced that its board of directors has named Robert (Bob) Swan as chief executive officer. Swan, 58, who has been serving as Intel's interim CEO for seven months and as chief financial officer since 2016, is the seventh CEO in Intel's 50-year history. Swan has also been elected to Intel's board of directors. Swan is a proven leader with a strong track record of success both within and outside Intel. As interim CEO, Swan has managed the company's operations in close collaboration with Intel's senior leadership team. Swan has been Intel's CFO since October 2016. In this role, he led the global finance, mergers and acquisitions, investor relations, IT and corporate strategy organizations. Prior to joining Intel, Swan served as an operating partner at General Atlantic LLC and served on Applied Materials' board of directors. He previously spent nine years as CFO or eBay Inc., where he is currently a director. Earlier in his career, he was CFO or Electronic Data Systems Corp. and TRW Inc. He also served as CFO, COO and CEO of Webvan Group Inc., and began his career at General Electric, serving for 15 years in several senior finance roles.